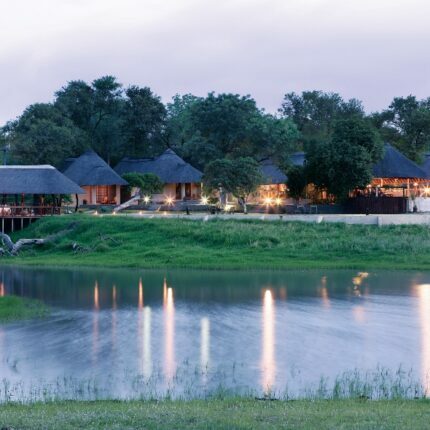 Arathusa Safari Lodge is an enchanting lodge which lies within the world renowned Sabi Sand Private Reserve, next to the unfenced Kruger National Park. 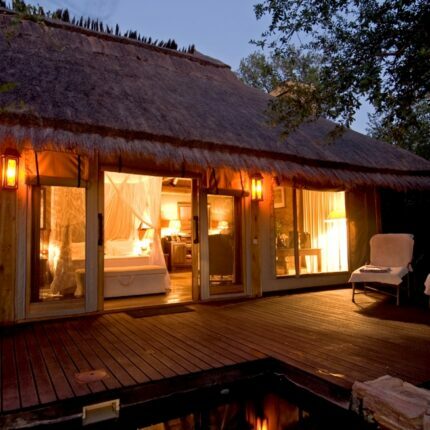 Arathusa has nine luxury water-facing rooms and four luxury bush-facing rooms. A luxury spa offers a wide choice of body treatments to soothe the body, relax the mind, and indulge the senses. Arathusa’s waterhole is its signature feature. There is never a lack of activity at the water’s edge and one need not leave the comfort of the camp to see buffalo, antelope and elephant families. Contemporary-Classic glamour and understated elegance meet at the Relais & Châteaux accredited AtholPlace Hotel, ensuring an unforgettable stay. 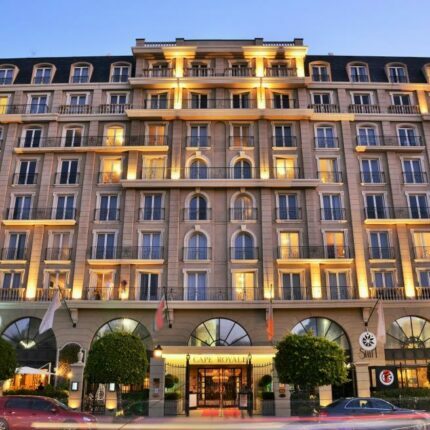 Situated in Atholl, one of the most beautiful parts of Johannesburg and only a short distance from the commercial centre of Sandton, AtholPlace Hotel is the best spot to be. Guests are invited to enjoy everything on offer, from the nine stylish and spacious Suites and the exquisite Villa, to the comfortably furnished library with romantic fireplace and the temperature regulated swimming pool surrounded by a large wooden deck. Dating back to 1692, Babylonstoren, beloved for its magnificent garden that is laid out over 3,5 hectares (8 acres) is a historic Cape Dutch farm that boasts one of the best preserved farmyards in the Cape. At Babylonstoren’s Farm Hotel, the overall effect is relaxed yet well-heeled with some of the existing farm buildings transformed into sophisticated guest accommodation. There are six one-bedroom suites, as well as three one-bedroom cottages and four two-bedroomed cottages. The hotel is characterised by thick whitewashed walls, elegant gables and hearty fireplaces that emulate an authentic farm stay experience. Shamwari Game Reserve strive to deliver a safari experience that leaves you feeling revitalised, refreshed and relaxed. 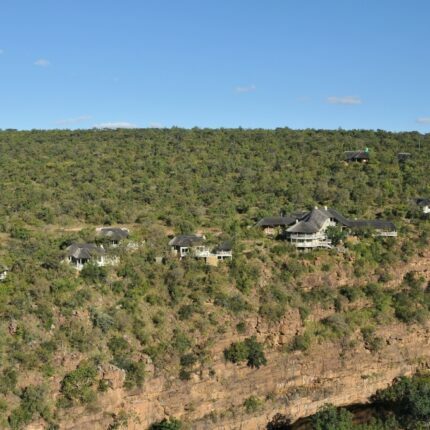 And, for a safari experience with a difference, guests can stay in one of the twelve luxurious tents at Bayethe Lodge. This malaria-free tented paradise offers guests the opportunity to immerse themselves in utter tranquillity, surrounded by the rich vegetation of this unique location that provides privacy and a feeling of seclusion with spectacular views of the African bush. 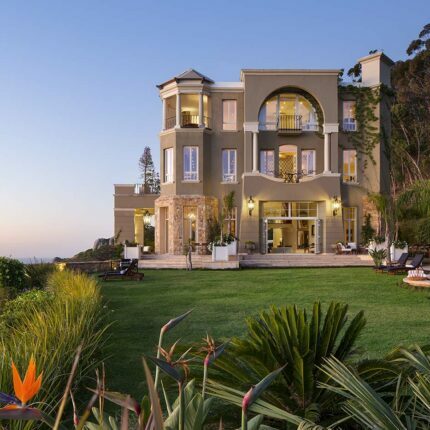 From its stunning clifftop position in the town of Hermanus, Birkenhead House enjoys exhilarating ocean views and close proximity to the beach. Breezy beach house style is mixed with contemporary artwork and opulent furnishings to create an elegant and inviting environment. Eleven suites with either sea or mountain views offer the height of comfort and luxury. Cliff and beach walks are an invigorating way to take in the air but numerous sporting and leisure activities are available in the area, from golf to shark-cage diving. Spectacular whale watching, for which Hermanus is famed, can be done from the hotel from June to November. 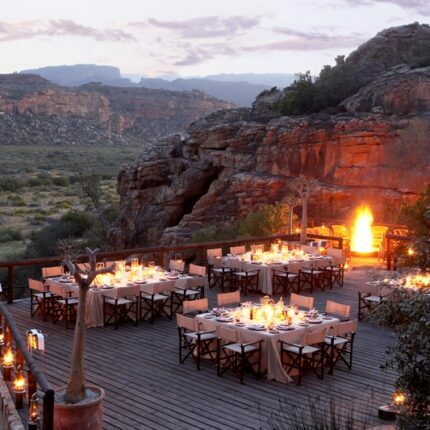 At the foothills of the Cederberg Mountains, the Relais & Châteaux accredited Bushmans Kloof Wilderness Reserve & Wellness Retreat is an ecological oasis within a roughly hewn and magical land. This spiritual retreat is a haven of staggering beauty and timeless tranquillity, where abundant wildlife roam free. Sixteen luxurious and indulgently comfortable guest rooms and suites are each individually designed with natural materials and elegant finishes, offering breathtaking views across the indigenous gardens. Koro Lodge, the private villa which includes a personal chef and guide, is located in a secluded corner of the reserve and welcomes children of all ages. Camp Jabulani is a five-star Relais & Châteaux accredited luxury lodge offering an extraordinary African experience for the discerning traveller. Camp Jabulani gets its name from an orphan baby elephant that was brought to the owners for rehabilitation. The owners adopted the little one, along with other orphaned elephants from Zimbabwe and the lodge soon became a sanctuary for them and other endangered species. The six private suites are luxurious and comfortable, each with a deck and heated plunge pool. Families or groups will appreciate the stand-alone Zindoga Villa where children can be accommodated. 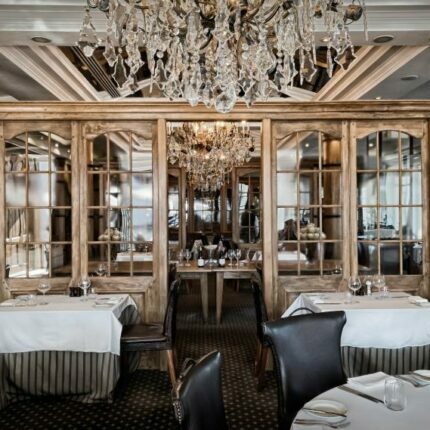 Cape Grace has held pride of place on its own quay in the V&A Waterfront for the past 20 years, increasing its reputation for ultimate style, luxury and service in the perfect waterfront setting. Each of the 120 luxurious rooms offer 5-star luxuries and extensive guest services. Children of all ages are made to feel especially welcome. Encircled by Table Mountain, the yacht marina, a working harbour and the bustling V&A Waterfront, there is no doubt that the Cape Grace is the ultimate Cape Town destination. Cape Royale Luxury Hotel offers guests a rare combination of ‘home away from home’ comfort and a venue exotic enough for you to want to leave the world behind. 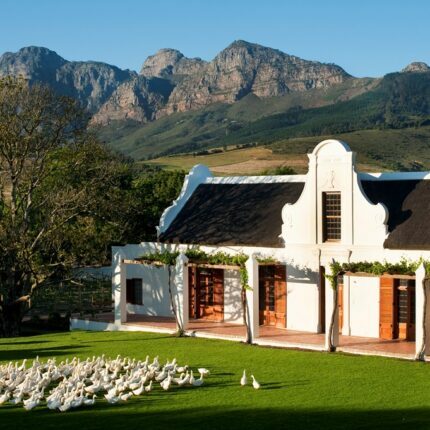 The Cape Royale brings together the familiarity and sophistication of Europe and the vibrant spirit of Africa. Cape Royale Luxury Hotel offers apartment-style accommodation in Deluxe One-Bedroom Suites, Superior Two-Bedroom Suites and Executive Three-Bedroom Suites with living areas and fully kitted kitchenette’s, which makes them an excellent choice for families or longer stays. 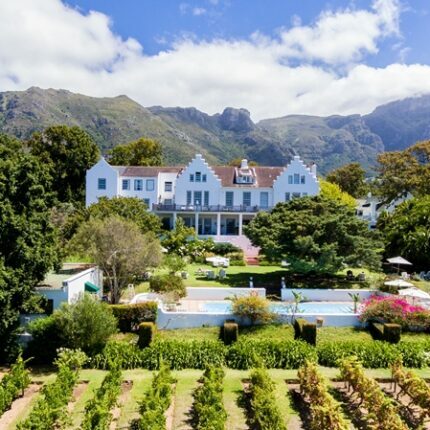 The Relais & Chateaux accredited Cellars-Hohenort is located in “Cape Town’s Vineyard”, the historical Constantia Valley on the breathtaking slopes of Table Mountain. All 52 rooms and suites boast panoramic views of the iconic mountain or over the 9.5 acres of beautifully manicured gardens. The Cellars-Hohenort is ideally situated as a central point from which to experience the diversity of activities, including Cape Point, Robben Island, Table Mountain, Kirstenbosch Botanical Gardens, Constantia Valley Wine Route, the famous beaches of Boulders and Camps Bay. Created as a tribute to the unique splendour of the African Wilderness, Clifftop Exclusive Safari Hideaway towers over the landscape combining modern African living, simplicity and an abundance of flavour with unique wildlife experiences. 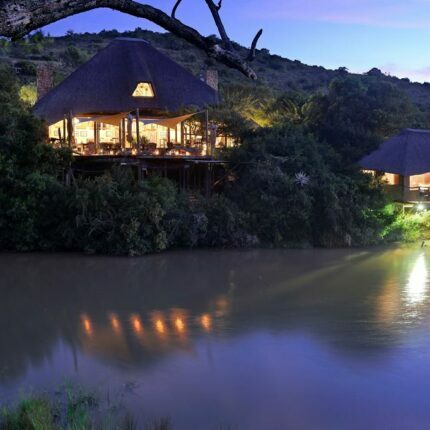 The lodge has eight luxury suites overlooking the flowing Sterkstroom River each enjoy their own private deck and plunge pool perched on the cliff, allowing guests the opportunity to view game from the privacy of their suites.